At BoardAssist we believe: find great people for amazing nonprofit boards and fantastic things happen! We identify and personally match high impact New Yorkers with incredible boards every day. Our placements have generated over 100 million dollars for the wonderful boards we serve, over the last 19 years, with over 90% of our placements serving as leaders on their boards within 12 months of being placed. Selectively adding to your board. Wondering what factors you should be carefully considering before joining a board? 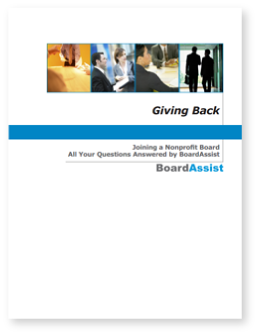 Learn more with Giving Back, our free guide to nonprofit board service, complete with case studies and answers to the FAQs we are asked most about board service.